Frustration. Setting. In. 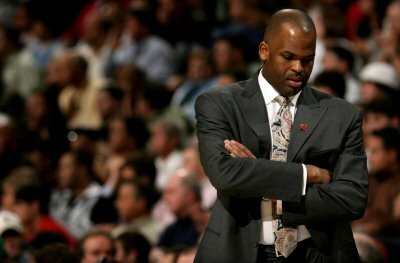 Nate McMillan. The Atlanta Hawks put on an absolute offensive clinic tonight at the expense of the Portland Trail Blazers. A complete embarrassment to the city of Portland. It's been years since I've seen a team do just about whatever they set out to do on every single offensive possession. Their offense was in such a rhythm, that the Blazers looked like a JV Division II squad on their way to a second home loss in just 3 home games. Can we start pointing fingers yet? I'm about to, Nate McMillan. I'm sick of the talking with no results, the lack of emotion from the bench and your apparent confusion in the middle of games. I'm sick of seeing zero growth. I'm sick of seeing zero toughness, one-on-one isolations for Roy, and the pick and roll. I'm sick of seeing zero pick and roll defense, missing defensive assignments and rotations. I'm sick of seeing your players looking completely lost in an offensive set, in a defensive set, and in their general role with this team. You are not getting through to them. You get a semi-pass for an injury plagued preseason which was supposed to be your time to work out kinks, mix in new players and see how much your superstars had grown in the offseason. Instead you dealt with nagging injury after nagging injury, traveled to random exhibitions in Canada and had the LaMarcus Aldridge contract negotiations in the back of your mind. Well "Sarge," we're 5 games deep and you no longer have any excuses. For 3 years now we've been talking about a lack of toughness, frustrations on defense and mediocre point guard play. When are you going to start addressing these things? When will we start seeing improvements? I understand it's only been 5 games, but I can't take this for another 77. I could not agree more, the Blazer offense seems stunted and the defense seems disjointed at best. I have been at all 3 home games so far this year and have not left a single one thinking I had just watched a team that knows what they're doing at all times. I hear ya Martin. Guys seems to be in unfamiliar situations and maybe that has to do with Oden's continued foul issues? With the guy constantly having to run back to the bench, the teams rotations are never what McMillan wants. And now with San Antonio coming to town, this thing could spiral further into this little black hole.